Reception: Friday, September 5, 2008 from 7 – 9 p.m. 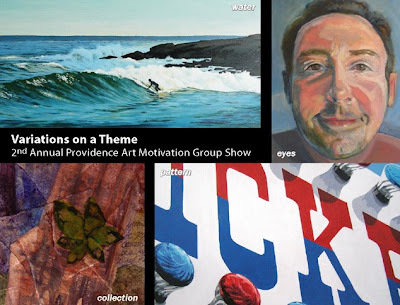 The Warwick Museum of Art invites you to join us Friday, September 5th from 7 – 9 pm for the opening of “Variations on a Theme.” This exhibition consists of multi-media artwork of fourteen local visual artists, members of the Providence Art Motivation Group. Stephanie Schechter (group organizer) Laura Atkinson, Wayne Bridge, Deborah Carlson, Chrystee Governo, Patty Johnston-Martucci, Nicole McDermott, David McGuirl, Deenie Pacik, Elise Rugens, Ewa Stosik-Moers, Dorota Streitfeld, David Tobin, and Jill Tyler will be exhibiting. Variations on a Theme explores the artistic interpretations of four subjects: Eyes, Water, Collection and Pattern. All works are available for purchase and include a wide array of media and disciplines: Acrylic, Oil and Watercolor paintings, Collage, Digital Art, Illustration, Mixed-media, Pastel, Photography, and Sculpture. Twice monthly, the Providence Art Motivation Group meets to provide support, direction and deadlines for visual artists in all mediums who need structure to be productive. At the end of each session, a theme is selected at random from group members’ suggestions. They then have two to three weeks to complete a piece of work, based on the new theme, in the medium of their choice to be presented at the next meeting. This exhibit showcases the dramatically different interpretations in terms of style, medium and realization of the subject theme. For instance, one artist may approach the subject of “pattern” by looking towards nature to find the patterns in a growing garden, another may incorporate swatches of patterned fabric into a mixed media collage. This show represents that one’s creative interpretation knows no bounds, and is not restricted to common vision. The artists explore deeper significance and expression of the simple subjects. This entry was posted in Uncategorized on August 11, 2008 by dorota.